KitLock is a small electronic lock suitable for securing cabinets and cupboards. Instead of using a key, access is gained by entering a code on the keypad. If you don’t have the code, you won’t be able to access the contents of the cabinet or cupboard. The obvious benefit of keyless entry is that you don’t have to manage keys. Keys often get lost and when they do replacements have to be cut and issued again. If a key is stolen, then the entire lock may need to be replaced. This can become problematic if you have many different keys and key holders to manage. It’s far easier to manage access codes on a digital cabinet lock than to look after hundreds of keys. Using a master code, user codes can be deleted and reset. A KitLock is preprogrammed in ‘repeated use’ mode, so that the same code can be used over and over again by an individual or a small group of people. For security reasons, it’s wise to change user codes on a regular basis to help prevent any misuse. KitLock digital cabinet locks are designed as a direct replacement for existing CAM locks already supplied on many cabinets. KitLock locks can also be fitted to cabinets and cupboards that don’t already have a locking device fitted, making it suitable for a range of different applications. Filing cabinets – often filing cabinets contain confidential information, which only certain staff members are authorised to access. If a member of staff leaves, then the access code can be changed quickly without having to inconvenience the other users. Medical carts – nurses in charge of issuing medicine to hospital patients will often wheel a locked medical cart from bedside to bedside. 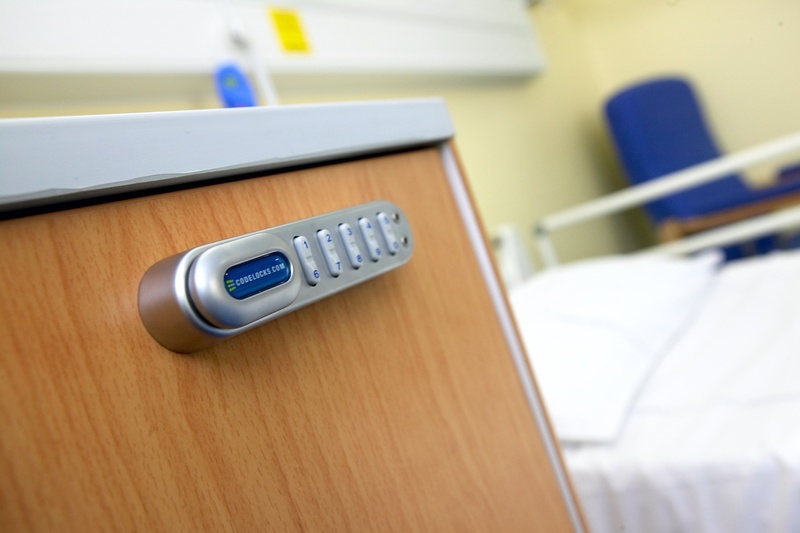 Using KitLock to secure the cart will relieve the nurses from having to carry a key. The user code need only be issued to the nurses who have authority to access the medicine. First aid or hazardous chemical cabinets – KitLock is ideal in situations where medicines for first aid or hazardous chemicals need to be kept secure for health and safely reasons. This applies to many schools, colleges, surgeries and workplaces. Kitchen cupboards – KitLock can be used to secure cupboards in areas like kitchens in shared accommodation. Some of our locks are in use on military bases, so that soldiers can store food in their own cupboards without having to worry about it being ‘borrowed’. This would also work well in student accommodation. Two products are available in the KitLock range. The KitLock 1000 is a small electronic lock that can be installed vertically or horizontally with right-hand and left-hand models available. The slightly more robust KitLock 1200 has ten individual stainless steel buttons that beep when pressed. This lock is supplied with a selection of spindle adaptors, which allow it to be installed on a variety of thickness of cabinet. Do you have an interesting application for one of our KitLock products? If you do, then we’d love to feature it on our blog. For more technical information on our digital locks for cabinets and cupboards, please call 01635 239 or visit our website. If you need more support, please contact our US office on +714 979 2900.